Yes, that’s me–diving off the blocks! Two teammates are in yellow caps. I wrote about it for Swimswam here. I wrote about how nervous I was in my prior blog–which was before the meet. So, what else do I have to say about the meet? Here’re a few more details and photos. I loved the people. I especially enjoyed talking with an 18-year-old from Mission Viejo Nadadores who said it was her first Masters meet, too. I asked her if she had been an age group swimmer. The home town pool the morning of the meet. She was a new swimmer, like I was—although we were definitely in different age groups! She did very well and won her events. I won a blue ribbon for my relay—in the mixed 45 and older medley. I loved cheering for and watching my teammates compete. I have a great group of friends and coach on the team. We’re all supportive of each other. The officials are great, too! Honestly, is there a better community than the swim world? I had fun cheering for two swim moms in particular—our kids swam and went to school together for years. It was a first swim meet experience for all three of us–as swimmers. Both of these swim moms want to continue to compete and get faster. Honestly, I’m content that I survived the experience. Me and one of my swim mom now US Masters friends. Sadly, I look nothing like my daughter, who is in the video below, lane one. I can’t believe how slow I look watching the video of my 50 free. Or how my stroke doesn’t look anything like I thought. While swimming, I visualize my daughter’s stroke in my mind. I was definitely out of my comfort zone, which is a good thing. If you’re interested in swimming, I strongly suggest you find a US Masters group and dive in. You don’t have to compete, and I guarantee you’ll get in shape, get tired, sleep well–and make great friends. What have you done lately to get out of your comfort zone? 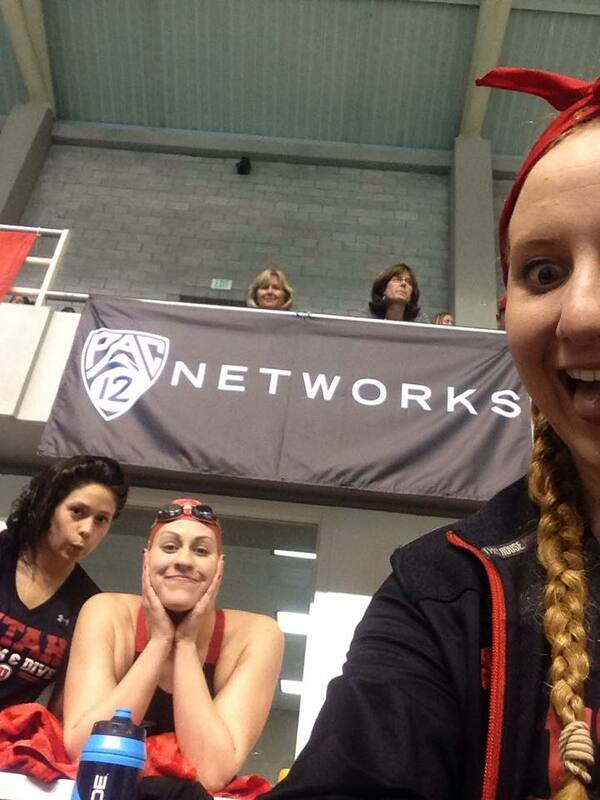 I can’t believe my daughter’s first PAC-12 Conference swim meet was in February 2015. All four meets were great experiences for the most part–exciting times spent with great families. It wasn’t as much fun the year she got the flu, or her senior year, when her “shoulder wouldn’t shoulder.” This year, my daughter and I are going together as spectators. She wants to cheer on her friends who will be swimming in their last conference meet, plus a distance swimmer friend, who she thinks will qualify for NCAAs. We’ll be able to visit Mom, too, who lives near the meet. I’m looking forward to a mother-daughter-grandmother visit! 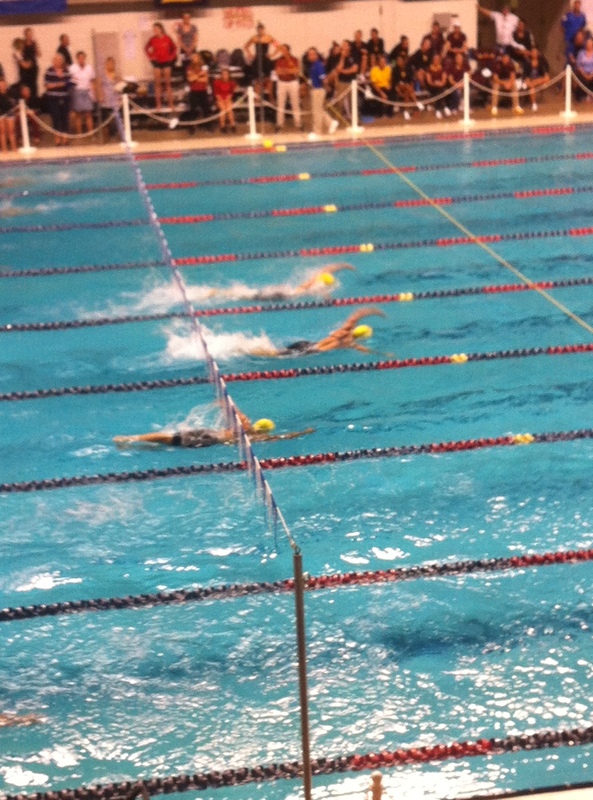 Olympic swimmer Missy Franklin competing at the PAC 12s. I couldn’t believe the conference meet was here already. 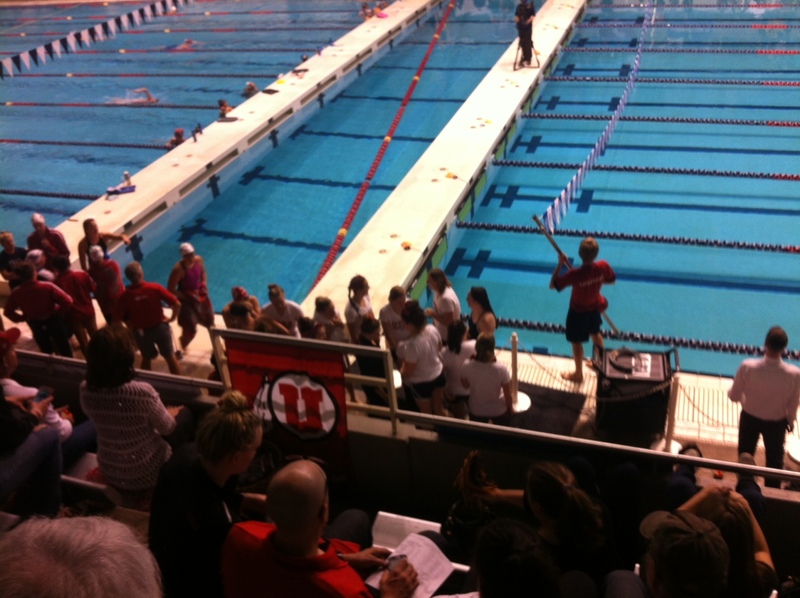 What happened to my daughter’s first year of college swimming? I was surprised by how easy it was to find a seat. Coming from age group meets that are crawling with kids and parents and you have to squeeze to get a seat, it was a pleasant change. However, it did get more packed as the days passed and always at finals. The stands at the PAC 12s. I still get nervous before Kat swims. Maybe it’s even worse than before. Especially at prelims. I thought I’d get over that queasy feeling, hand-shaking, palm-sweating attack. But, no I did not. I wanted to spend a little time with Kat. But, she’s on the deck with her team, and we’re up in the stands with the parents. That’s me up in the stands looking down on my daughter. I have met some great swim parents on our new team. Don’t get me wrong, there are great families on our club team that I’m life long friends with. I’m thrilled to meet parents on the college team that are friendly and fun, too. I guess that’s what swimming parents are like. It’s fun to cheer at the PAC-12 conference, hold up signs, and wave pom poms. Kat would have killed me if I behaved that way at an age group meet! Now that it’s the last day of PAC-12s, I’m shocked at how fast the days went by. Do I really have to wait an entire year to experience this again? Looking down from the bleachers at my daughter, I’m amazed at how much she’s matured this year. She’s happy and comfortable with her new family, her college team. She has grown independent from us and she’s doing really, really well. I’m happy and proud, but I’m wiping a few tears from eyes, too. My daughter and Piranha friends. When we drove all over Los Angeles looking for a vuvuzela for our son. He wanted to cheer on all his teammates at Junior Olympics. We drove from Santa Clarita where we were at a meet to Orange County where we had another meet. We finally found the vuvuzela in between in Los Angeles. It was the year the vuvuzela was making a big splash during World Cup Soccer. Within a few hours of my son cheering on his teammates with the blasting horn, other teams started complaining. And then the vuvuzela was “accidentally” broken. We blamed a parent on another team, but my daughter told me today that it was a parent on our own team! One of my kids’ teammates brought a little electrical hand-held disc game called Catchphrase to a June Age Group Championship meet at La Mirada. The kids sat under the pop-up tent, playing the game for hours on end while waiting for their events. Then, back at the hotel where most families were staying, we kept on playing into the night—parents included. I’ll always remember that meet as one of the most fun. We were in Moreno Valley at a meet Mother’s Day weekend, and it began hailing! My daughter and her friends were swimming the 200 back and during their heat, the officials cleared the pool because of thunder and lightning. It took forever to get the swimmers attention and get them to exit the pool. My daughter and a few friends sat in the back of our Sequoia drinking chocolate milk and singing loudly with the radio for an hour—waiting for the storm to pass. Looking back on the age group swimming days, there are no bad memories. When things looked awful or stressful at the time, I can laugh about now. My kids with their teammates. What are some of your favorite youth sports memories with your kids? Long Course at our pool. I returned to swimming Masters and although I’m amazingly weak and slow, I’m thrilled to be back. I like the summer schedule and the fact that it’s Long Course. For non-swimmers that means the pool lanes run the length of the 50-meter pool, as opposed to across the pool, which is 25 yards for Short Course. I remember a few years ago when I began swimming Masters, I’d never go on Saturdays because it’s Long Course. Now there’s Long Course throughout the week–and I’m there. I actually prefer it. Even though I’m recovering from knee surgery and I can barely swim 30 minutes without getting exhausted, there’s something about how good it feels. I find a nice rhythm and my mind has more time to think and wander before I hit the wall. I feel like I’m swimming more as opposed to pushing and bouncing off the walls back and forth like a ping-pong ball. Last week was my first day back to the US Masters Swimming program with Piranha Swim Team since December. Of course, that’s because of the great ski vacation I had early January that ended with a toboggan ride escorted by the Ski Patrol at Alta, Utah. Anyway, last week I could only swim 500 meters without feeling winded, exhausted and my knee hurt. Today is Monday of week two, and I felt stronger and made it 900 meters. It’s great to be back, and our coach was right. Returning to Masters and being with my swim buddies is motivating and will help me recover faster, as opposed to going on my own. I strongly recommend joining a Masters team to anyone, regardless of their swimming ability. Sunset at our pool during a meet. I woke up thinking “it’s June first and where did my year go?” Mostly nowhere is where my year went thanks to falling on the slopes January 2nd. It’s been a long five months of being injured, having surgery and slowly recovering. I looked back at what I was going last year at this time and it was all about being together as a family. This past weekend, I was in mom heaven. My daughter was at a swim meet an hour away from where my son now lives. We didn’t do anything that special, we got to hang out together. It was one of my favorite weekends in recent memory. At first, I was worried about how my daughter was going to do at the meet. She had already told us that due to other things going on in her life, her last few weeks of practice were not consistent at all. She thought I was delirious. She was very realistic about what she could do at that point in time. I have to admit that after her first race, I got it. I relaxed about the times and understood that this meet was about being together as a family. It was a small slice of time where we could hang out and enjoy each other’s company. If I had been focused on her times and upset that she wasn’t at her peak fitness, I’d have been so disappointed. Instead, I reflected on being the mom of two almost grown kids that I’m so proud of. And, the fact that they enjoy being with me and each other. My daughter getting instructions from her coach. Later, after fits of laughter, we hung out together in a park, lying on the grass and staring at the green leaves and blue sky. The park by the Santa Clara pool. We shared books, ideas and meals. My son’s vocabulary had us looking up new words and trying to memorize and pronounce them, like “primogeniture.” One of my kids favorite things to do was to copy our faces. My son does an imitation of me, while Kat has perfected her dad’s scowl. It always ended in a burst of laughter and fits of giggles. 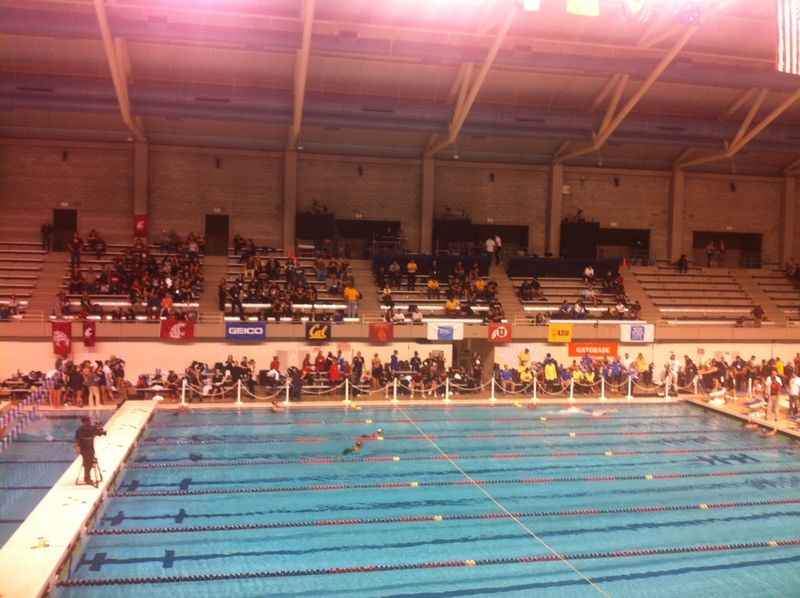 The swim meet was exciting with a who’s who in the swimming world in the final heats. I witnessed amazing races and the international flavor was so hopeful and invigorating with countries in attendance including Argentina, Mexico, Japan and China. It may be the last time we’ll be staying in a hotel with our daughter at a meet. Ever. Her final college season is ahead this fall and she’ll be with her team, not us. I was a little teary-eyed when the weekend flew by and it was time for me to return again to my empty nest. My super heroes at the Winchester Mystery House.